Displey filled with 99pcs of Paint-&-Peel bottles. 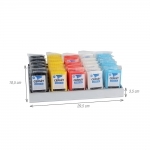 Display without contents, made of metal, to be hooked in a perforated wall • EMB 718 000 007 (5 color x 7 pcs each x 56g) Pre ordering product (14 days appr). 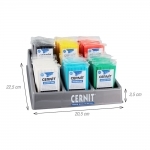 Display without contents, made of plastic • EMB 718 000 004 (6 color x 6 pcs each x 56g) Pre ordering product (14 days appr). 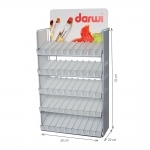 Display without contents 40 x 12 x 56g • EMB 718 000 005 It consists of 5 shelves, 8 cases per shelf. 40 colours can be presented in this display. Pre ordering product (14 days appr). 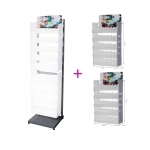 Metal structure for sales displays EMB 718 000 005 Pre ordering product (14 days appr). 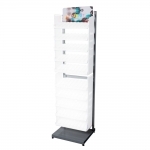 Structure (EMB 718 000 013) with 2 displays (EMB 718 000 005) It consists of two displays with each 5 shelves, 8 cases per shelf. 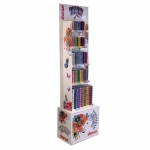 The entire colour range can be presented in this display. 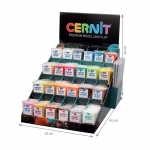 Display without contents 80 colors x 12 pcs each x 56g Preordering product (14 days appr). 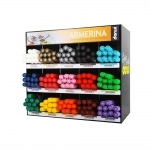 Suitable for each 10 markers Armerina or Acryl Opak or Tex or Tex Opak or Tex Glitter or Leather in 15 different colours. The sticker on the top of the display changes depending on the selected range. Preordering product (14 days appr). 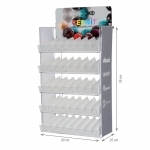 Display without contents 50 x 7 x 30ml • EMB 718 000 002 It consists of 5 shelves, 10 cases per shelf. 50 different colours in 30ml can be presented in this display Pre ordering product (14 days appr).